This photo of the asteroid Lutetia is one of the closest views ever of the asteroid. It was taken from a distance of about 80,000 km during a July 10, 2010 flyby by Europe's comet probe Rosetta. Full Story. AEuropean spacecraft zoomed by past a mysterious asteroid Saturday to take thefirst-ever close look at the space rock while flying more than 282 million miles fromEarth. TheEuropean Space Agency?s (ESA) Rosetta space probe flew past the asteroid Lutetia,an object discovered in 1852 that appeared only as a bright speck in the sky toastronomers until today. The first newphotos of the asteroid revealed Lutetia to be a lumpy rock with apotato-like appearance. Rosetta was about 1,900 miles (3,100 km) from theasteroid at its closest approach. 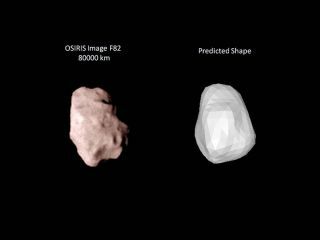 Theenigmatic space rock, which is about 62 miles (100 km) wide, is from the mainasteroid belt that orbits between Mars and Jupiter. From Earth, Lutetia simplyappears as little more than a single point of light to ground-based telescopes. ?We knowapproximately its size and rotational period,? Rosetta project scientist RitaSchulz said in a live webcast during the probe?s flyby. ?The rotational periodis something like eight hours, and that will be confirmed after the flyby. Weare now going to get the details. What is very important for us is thecomposition of the asteroid." Thespacecraft launched in 2004 and is expected to arrive at the comet in 2014. Rosettaalso visited a different space rock, the asteroidSteins, in 2008. Saturday'sasteroid flyby was watched over by dedicated team of mission scientists at theESA Space Operations Center in Darmstadt, Germany. The rendezvous was webcastlive on ESA's website. At1514 GMT (11:15 a.m. EDT), Rosetta Spacecraft Operations Manager AndreaAccomazzo confirmed that the probe had entered autonomous tracking mode inpreparation for the flyby. The navigation camera was used to keep thespacecraft pointed at Lutetia. Theclosest encounter occurred at approximately 1610 GMT (12:10 p.m. EDT), withRosetta traveling at a relative speed of 32,400 mph (52,142 kph). ESAscientists were able to track Rosetta up to five minutes to closest approach,after which the radio signal with the probe was lost as the spacecraft turnsits antenna away from Earth and faces the asteroid instead. Afterapproximately 40 minutes, a series of maneuvers restored the antenna?s Earthlock, and the probe began successfully transmitting data and telemetry back toits ground controllers once again. ? ESAscientists hope the observations from the Lutetia flyby will contribute to therelatively small body of knowledge aboutasteroids. Theclose pass allowed Rosetta about two hours of observation time to scrutinizethe asteroid Lutetia. Rosettawill continue beaming this data to Earth, and the first close-up pictures fromthe quick visit are expected to be released later tonight. Preliminary imagesfrom ESA were released in the lead up to the encounter, showing Lutetia loominglarger and larger as Rosetta approached within about 49,700 miles (80,000 km). The data collectedfrom Rosetta?s visit will provide valuable observations for asteroid science,and will at least give scientists preliminary information that can then becorroborated through ground-based observations. And, the findings will not onlyapply for Lutetia, but for other asteroids as well.